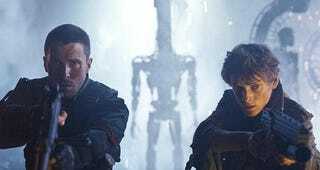 In trying to describe how much they disliked the new Terminator movie, many movie reviewers decided that comparing it to video games would do the trick. Terminator Salvation, the fourth Terminator movie, opened last weekend to cranky reviews. They wrote: this movie's like a video game. *The Memphis, Tennessee Commercial Appeal's John Beifuss: "...The giant shape-shifting robots (which harvest humans like the Martian machines in Spielberg's "War of the Worlds") are more Transformer than Terminator; they seem to have been designed for video games and Toys R Us spinoffs rather than for movie sequels." *Gizmodo's Mark Wilson: It's a two-hour video game linking a series of sequences that have little reason for existence other than McG's action-packed directing style. In the future, if you&apos;re walking around and encounter a Terminator, do not run. I didn't see the movie. Any gamers out there think this is inaccurate criticism? Or is Terminator Salvation guilty as charged of being too video-gamey?